Hypnotherapy Surrey is a collection of highly trained hypnotherapists operating in Surrey. Although our head office is in Wallington, Surrey which is on the border between London and Surrey we have other clinics spread around Surrey. Simply Call us on 020 8669 6990and we will book you in to the appropriate clinic for you. So we pretty much cover the whole of Surrey. All the hypnotherapists at our offices have been trained by the Surrey Institute of Clinical Hypnotherapy to a very high standard. Each hypnotherapist in all of our offices will have individual specialisations and we may refer you on to the specialist on your issue. 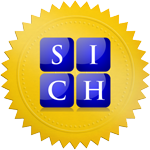 All our accredited hypnotherapists will display the SICH accredited logo prominently on there websites. If you do not see this logo they may not meet our high standards. If in doubt give us a call. Our Wallington, Surrey head office is within easy reach from central London being only 23 minutes from London Victoria. The nearest train stations in order of proximity are Hackbridge, Wallington and Carshalton. All three stations are within 10 minutes walk and Hackbridge station is just 700 metres away. All the maps of our offices are under the ‘Contact Us’ menu item at the top of every page. To find our associate offices please call us and we will be happy to direct you to the right office.